Pain from the hip joint is commonly experienced in the groin region, but can also refer to the lateral hip region, the medial knee, under the crease of the buttock and the lateral leg. The pain can occur spontaneously with no obvious cause, but on examination there is often quite restricted hip joint mobility and muscle weakness which suggests a gradual asymptomatic onset. 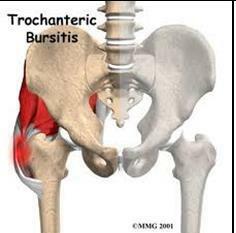 Acute anterior hip pain may be related to iliopsoas bursitis or tendinitis, and is often caused by an unusually difficult or prolonged walking session (bush walking or going on a walking holiday). This injury can be treated with stretching and strengthening of iliopsoas, ice, and strengthening of the stabilizing muscle of the lumbo-pelvic region, particularly the gluteal muscles. “Clicky” anterior hip pain is usually a long, weak iliopsoas muscle/tendon unit, and responds well to specific strengthening exercises and again, strengthening of the stabilizing muscles of the lumbo-pelvic region. This condition is often seen in flexible females, such as dancers or gymnasts. The most common loss of ranges of movement of early stage osteoarthritis of the hip is extension and rotation. Often the patient will present with a mild hip flexion deformity resulting in an anteriorly rotated pelvis. This anteriorly rotated pelvic position leads to increased shear forces at the L5S1 segment of the lumbar spine, and can lead to associated degenerative changes at the L5S1 facet joints and the L5 disc. Patients with chronic or recurrent non-specific low back pain from the L5S1 region should have their range of hip movement assessed and treated as required, as well as having the lumbo-pelvic-hip musculature assessed for strength and length. Superficial lateral hip pain which is tender on palpation is usually a result of bursitis of the trochanteric bursa and associated gluteal tendinopathy. This usually responds favourably to conservative physiotherapy management including the glut medius tendinopathy program, ice, hip joint mobilisations, and correction of lumbo-pelvic stability and muscle lengths. Even if the bursa requires a local steroid injection, correction of the associated muscle weaknesses or loss of hip joint mobility is essential to prevent recurrence.